Citation: Bawadukji NA, Jabra R. Formulation, Preparation, and Mechanical Characterization of Nitrile-Butadiene Rubber (NBR) Composites. Mater Sci Ind J. 2017;15(1):116. The present research aims at preparing and characterizing of different formulations of NBR Krynac 3370F rubber with different contents of three inorganic reinforcing fillers: conventional N330 carbon black, nanometric aerosil 200 silica and micrometric volcanic tuff. In compounding rubber batches, the content of various additives (reaction activator; accelerator; plasticizer; anti-oxidant & vulcanizing agents) were fixed at the optimum known proportions and the reinforcing filler content has been varied between 10 and 100 phr. The study addressed, firstly, the determination of appropriate processing conditions for batches and testing samples preparation, and secondly the investigation of filler nature and content effects on the vulcanized rubber mechanical properties, namely, tensile strength, tensile elongation at break, Young modulus, toughness, and Shore A hardness based on ASTM D412 and DIN 53505. The present work showed the feasibility of changing reinforcing fillers content in NBR Krynac 3370F rubber within large interval enabling varying and improving its mechanical properties according to the requirement of various applications. The present work allowed also the comparison of carbon black, fumed Silica and volcanic tuff effects on processing conditions and mechanical properties of NBR Krynac 3370F rubber formulations. Elastomers refer to the group of polymers that exhibit rubbery or elastic behavior, including natural rubber and synthetic rubbers. The American Society for Testing Material ASTM defines elastomer according to ASTM D1566-66T as "macromolecular material that returns rapidly to approximately the initial dimensions and shape after substantial deformation by a weak stress and release of the stress." The twentieth century witnessed, among various spectacular technological advances, the development of a huge rubber production reaching some 30 million tons per year. This wide production and application of these rubber-like materials have been based both on chemical synthesis and rubber formulation. Beside natural rubber, synthesis allowed the development of some 20 types of synthetic rubbers, but formulation continues to widen the field of each kind of new or conventional rubber. Formulation goals have constantly focused on improving rubber physical properties and performance, protecting rubber products against different types of degradation during processing and service and finally reducing product cost. Nitrile-Butadiene rubber (NBR) is particularly known for its excellent heat performance and high chemical resistance against oils and chemicals. NBR rubber exhibits, on other hand, good mechanical properties. Since its appearance in 1930, NBR production amounted to about 480,000 tons in 2001. Formulation of NBR rubber continues to attract research and development interest through diversification of reinforcing fillers, examination of different vulcanization system and the investigation and improvement of multiple rubber-filler interactions. Due to its nano-metric structure morphology and low cost, carbon black has been the oldest reinforcing filler for rubbers, especially in the tire industry. By the late twentieth century and the beginning of the third millennium, and with the development and diversity of nanometric powders, attention began to study the replacement of carbon black partially or completely by inorganic known or new powders. Among these powders, attention focused on the various forms of carbon such as graphite and carbon nanotube and on some forms of natural or synthetic silicates, such as nano silica, nano-clay and some volcanic tuff and industrial slag. Blaz Likozar and Zoltan Major in 2010 studied the effect of multi-wall carbon nanotube on the morphology, mechanical and thermal properties of nitrile and hydrogenated nitrile rubber and the variation of these properties with respect to acrylonitrile content in the rubber . 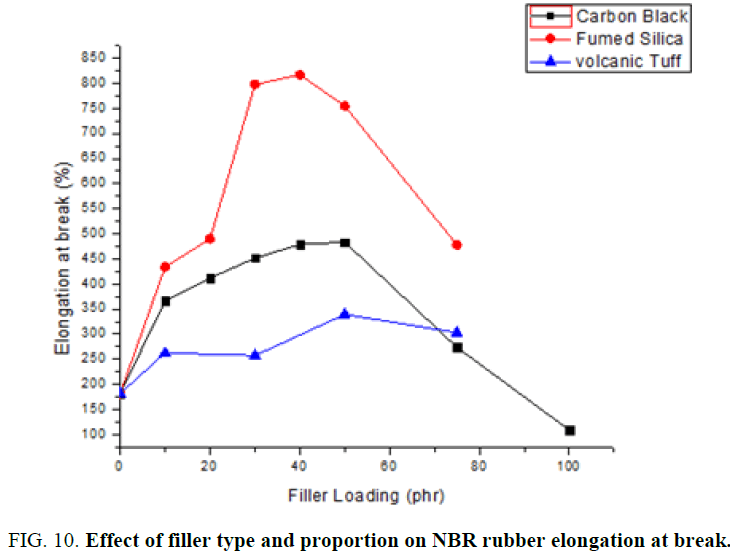 In 2008, A. Mostafa and colleagues studied the effect of carbon black loading on the swelling and compression set behavior of NBR rubber and compared it with the Styrene-butadiene (SBR) rubber at different temperatures. This study showed that the proportion of swelling, unlike compressibility, decreases with increasing carbon black loading with a clear superiority of nitrile rubber . In 2013, Sunil Padhiyar and Darshan Shah investigated the effect of silanes in NBR rubber loaded with carbon black and silica and its role in improving filler distribution within the mixture and achieving the filler- polymeric chains crosslinking (crosslinking agent). This study showed that silanes compounds increase rubber mixture viscosity and crosslinking density, but decrease, by contrast, swelling resistance . In 2015, Mohaimen Alneamah and Mohammed Almaamor studied the impact of polyimide concentration on improving thermal stability of carbon black loaded NBR rubber . In 2001, Khaled F. El-Nemr studied the effect of different curing systems (sulfur, dicumyl peroxide, radiation) on the physical, chemical and mechanical properties of carbon black loaded NBR rubber . The present work addresses the preparation of three Nitrile-Butadiene NBR rubber formulations differing only by the reinforcing filler and preserving the other components of NBR batches. For this purpose, three reinforcing powders have been selected, namely, conventional carbon black in the first group, nano-silica in the second and local natural volcanic tuff in the third. Working under fixed preparation conditions, the present work aims at investigating the NBR rubber loading capacity for each reinforcing filler and studying the effect of filler loading without any coupling agent or compatibilizer on mechanical properties of the resulting NBR formulation. TABLE 1 shows the suppliers and properties of N330 carbon black  and aerosil 200 nano-silica  and the other additives used in the NBR rubber batches. TABLE 1: Properties and suppliers of carbon black N330, aerosil 200 nano-silica, natural volcanic tuff, and other additives. It should be noted that the natural volcanic tuff has been exposed to the process of grinding during one hour using a ball mill model Retsch in order to obtain a micro powder with grain dimensions smaller than 20 μ sieve. TABLE 2 shows the chemical composition of the natural volcanic tuff . TABLE 2: The chemical composition of the natural volcanic tuff. TABLE 3: The properties of raw NBR Krynac 3370F rubber. The third group includes four compositions of NBR rubber with increasing proportions of natural volcanic tuff (10,30,50,75 phr). Groups designation is as follows: NBRxC for the first group; NBRxS for the second one and NBRxVT for the third group, where x refers to the (phr) ratio of carbon black, nano- silica or natural volcanic tuff. TABLE 4 shows the proportions of raw materials used in the formulation of NBR rubber mixtures within the three groups (Phr: parts per hundred of rubber by weight). TABLE 4: Proportions of raw materials used in the formulation of NBR rubber. NBR rubber mixing and homogenization were done using an internal mixer (Brabender mixer) at temperature of 120°C to reduce NBR rubber viscosity and to achieve homogeneous distribution of the additives taking care to not exceed the temperature of 125°C at the end of the mixing process (to avoid early vulcanization). The mixer is linked to computer which controls the introduction of the working parameters such as temperature, torque level and rotation speed at 30 rpm. During the mixing phase, the temperature, and the torque curves as a function of time at the working temperature are recorded and the additives are charged separately following standard master batch . Vulcanization and forming of NBR rubber sheets: NBR rubber pieces from the internal mixer are placed inside the anti-adhesion pre-coated metal mold which is then heated without applying pressure for 2-3 min to ensure that rubber batch flows and fills the mold taking care to open partially several times the mould cover to avoid air pockets formation. After that, pressure is applied for 50 min at the temperature of 160°C and then, mold is cooled until 30°C under pressure to avoid sample contraction. Thus, similar sheets of 15.5 × 9.5 × 0.25 cm3 dimensions were prepared from 3 NBR rubber formulations (with carbon black, nano- silica and volcanic tuff). By this way, NBR rubber sheets were formed with 0, 10, 20, 30, 40, 50, 75, 100 phr carbon black ratio, 10, 20, 30, 40, 50, 75 phr nano- silica ratio and 10, 30, 50, 75 phr natural volcanic tuff ratio. Within these conditions, it was not possible to increase the proportion of nano-silica at the same plasticizer proportion, this fact could be related to silica nanometer grains dimensions, high specific surface, and mutual physical interactions with rubber chains. All these parameters hinder NBR rubber-nano-silica mixing process. For the grinded natural volcanic tuff, grains were relatively of large micrometric dimensions (to avoid long and costly grinding times) and small specific surface compared with nano- silica, therefore, mixing them with NBR rubber did not induced any difficulty. Forming tensile samples: For tensile testing, samples were cut according to the dimensions shown in Figure. 1 and TABLE 5  using CEAST cutting machine under 4 bar air pressure and one cutting stroke to avoid defects formation on the sample surfaces. Figure 1: Tensile test sample. TABLE 5: Tensile test sample dimensions. Forming hardness samples: Shore A hardness test in accordance with DIN 53505 standards  requires sample thickness of 4-6 mm. For this purpose, copper mold with an internal diameter and height of 55 mm and 7 mm, respectively, has been used to form hardness samples. Specific gravity: Specific gravity of the NBR rubber mixture samples was determined by dividing NBR rubber sheet weight (m in g) to its volume (V), where V = 15.5 × 9.5 × 0.25 cm3. On the other hand, specific gravity can be estimated theoretically using the rule of mixtures, i.e., ρ = ρ1V1 + ρ2V2, where ρ1, V1 and ρ2, V2 represent specific gravity and volume fraction of NBR rubber and reinforcing powder respectively. Tensile test: Tensile tests were carried out according to ASTM D412 standard  on five samples for each rubber batch. Test and sample parameters were first introduced to the computer controlled universal testing machine (Adamel Lhomargy): Sample gauge length: 25 mm; Sample width: 4 mm; Sample thickness: 2.5 mm; Sample cross-section area; test speed 300 mm/min. Tensile strength at break: Where, σ: tensile strength at break (MPa), F: tensile force at break (N), S: The initial sample cross-section area (m2). Modulus of elasticity (Young modulus): Where, E: Young's modulus (MPa), Δσ: Tensile stress difference (MPa) between 0% and 100% strain or 0% and 300% strain, Δε: Strain difference between 0% and 100% strain or between 0% and 300% strain. Strain at break: Where ε: Strain at break, ΔL: Elongation (mm) at break, L0: Sample gauge length (mm). Hardness test: For each rubber batch, hardness test has been done, according to Shore A system and DIN 53505 standard , on cylindrical samples of 55 mm diameter and 7 mm thickness. Test device records the hardness value resulting from the insertion of a standard needle in a test sample and the process is repeated five times on each sample. Hardness values represent the average of the five readings. Un-vulcanization rubber mixing: Torsion torque observation during rubber mixing and homogenization with different proportion of carbon black, fumed silica and volcanic tuff at constant temperature and rotation speed of 30 cycles/min allows to continuously follow-up torsion torque change during mixing. Figure. 2 shows torsion torque variation during mixing of 10 phr silica NBR rubber batch. 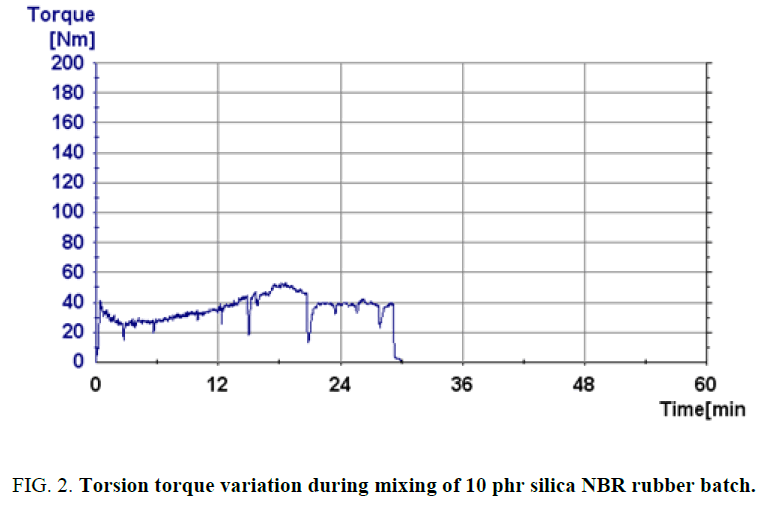 Figure 2: Torsion torque variation during mixing of 10 phr silica NBR rubber batch. Figure. 2 shows torsion torque increase up to a maximum of around 50 Nm after 18 min. Torsion torque maximum values are represented for each NBR rubber batch. Figure. 3 shows the variation of maximum torsion torque values with the reinforcing filler type and content. Figure. 3 shows the decrease of maximum torsion torque values with increasing proportion of carbon black and silica up to 40 phr. This torque decrease is related to the double effect of the mixing temperature and the plasticizer. After 40 phr, torque increases with the proportion of carbon black and silica because their volume fractions become relatively high and plasticizer proportion not quite enough. Within these working conditions and to avoid increasing plasticizer proportion in order to lower the viscosity of the NBR mixture, carbon black and silica content did not exceed 100 phr and 75 phr respectively. Regarding volcanic tuff, torque continues declining with the increase of its content in the NBR mixtures. This behavior could be related to its relatively large particle size and small specific surface compared with carbon black and fumed silica. 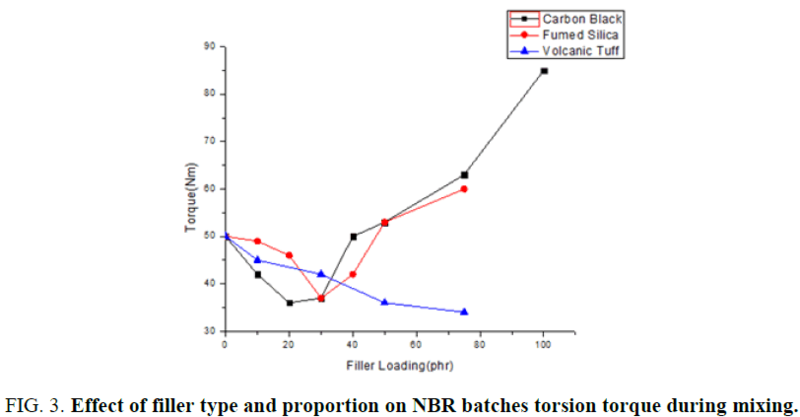 Figure 3: Effect of filler type and proportion on NBR batches torsion torque during mixing. TABLE 6 shows the physical and mechanical properties of vulcanized NBR Krynac 3370F rubber mixtures with different proportions of N330 carbon black, aerosil 200 fumed silica and volcanic tuff. NBR C-NBR Carbon black, NBR S-NBR Silica, NBR VT-NBR Volcanic tuff, SD-Standard Deviation. TABLE 6: The physical and mechanical properties of NBR Krynac 3370F formulations. Figure. 4 shows specific gravity change with filler type and proportion. Figure 4: Effect of filler type and proportion on NBR rubber specific weight. Specific weight of NBR rubber increases generally with filler proportion (carbon black , fumed silica and volcanic tuff). The specific weight values of the NBR rubber with volcanic tuff are higher than those with carbon black and fumed silica. The increase in specific weight results from the fact that the densities of carbon black and fumed silica and volcanic tuff are higher than that of NBR Krynac 3370F rubber and that the order of specific weight of these powders (assuming non-porous volcanic tuff grains after grinding) is volcanic tuff ≥ fumed silica>carbon black. There is an opportunity to reduce the dimensions of volcanic tuff, which may improve the properties of NBR rubber mixture, but this requires a large and expensive times of grinding. The theoretical and experimental specific weight results (TABLE 6) are consistent with each other. Tensile properties: Figure. 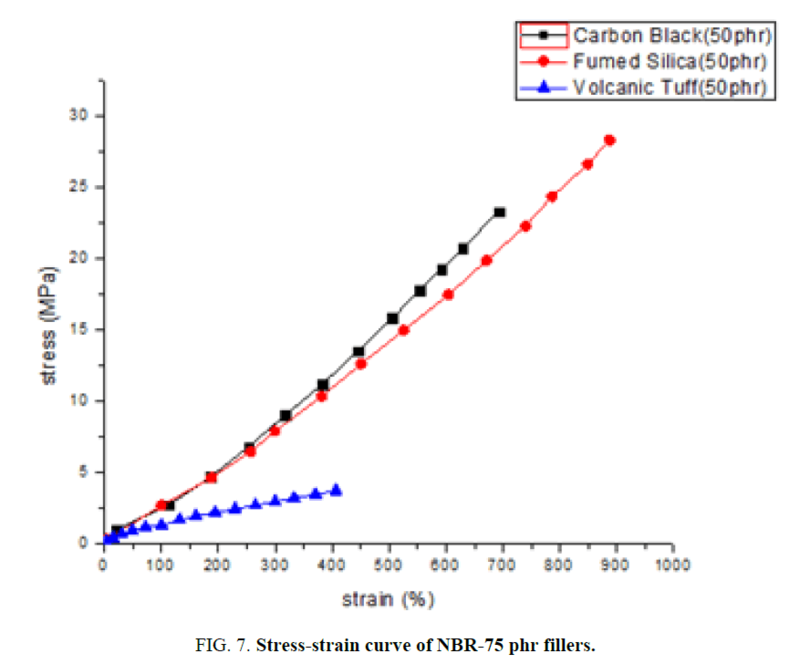 5, 6, 7, 8, and 9 give stress- strain curves of NBR rubber mixtures as a function of fillers type and proportion. Figure 5: Stress-strain curve of NBR-30 phr fillers. Figure 6: Stress-strain curve of NBR- 10 phr fillers. Figure 7: Stress-strain curve of NBR-75 phr fillers. Figure 8: Stress-strain curve of NBR-50 phr fillers. Figure 9: Effect of filler type and proportion on NBR rubber tensile strength. Effect of filler type and proportion on NBR tensile strength: The Figure. 9 shows the change of NBR rubber tensile strength with the type and proportion of filler. 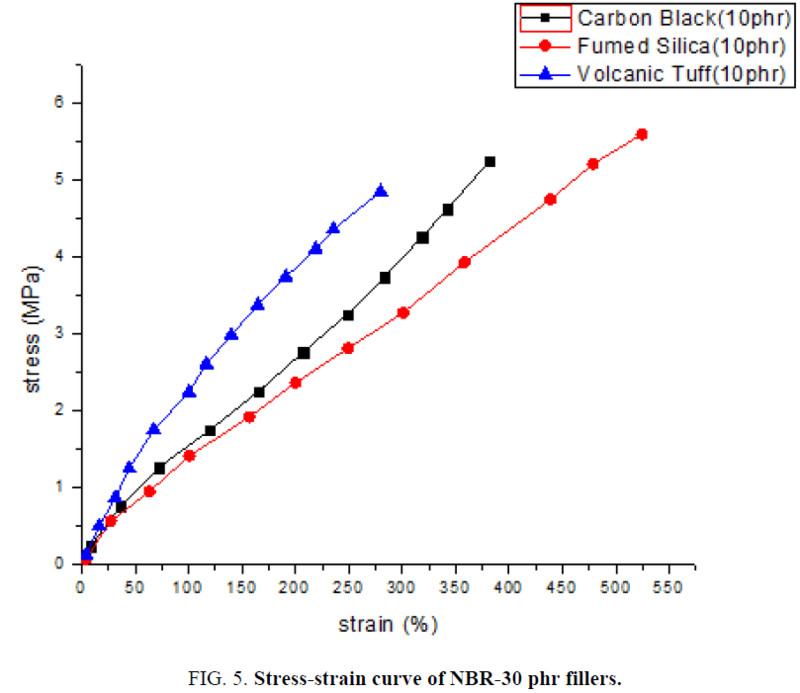 Effect of carbon black on NBR rubber tensile strength: NBR rubber tensile strength increases clearly with carbon black proportion up to 20.48 MPa at 50 phr carbon black ratio. After that, tensile strength seems to stabilize or to decrease. This can be attributed to the substantial increase of carbon black volume fraction in the batch and the inability of NBR rubber to cover and coat carbon black particles. This is consistent with the study conducted by Mohammad H. Al-maamori . Effect of fumed silica on NBR rubber tensile strength: Figure. 9 shows that nano silica improves significantly the mechanical properties of NBR rubber. This has been confirmed by K. Rajkumar and al. with nano silica loading up to 5 phr . Figure. 9 shows also that NBR rubber strengthening with fumed silica is more effective than that with carbon black . This can be attributed to the polarity of NBR rubber that enhance mutual interactions between rubber and polar groups on silica particles. On the other hand, the higher specific surface of silica particles compared with that of carbon black contributes also to the increase of those silica-NBR rubber mutual interactions. All these factors lead to the improvement of NBR rubber mechanical properties with silica. 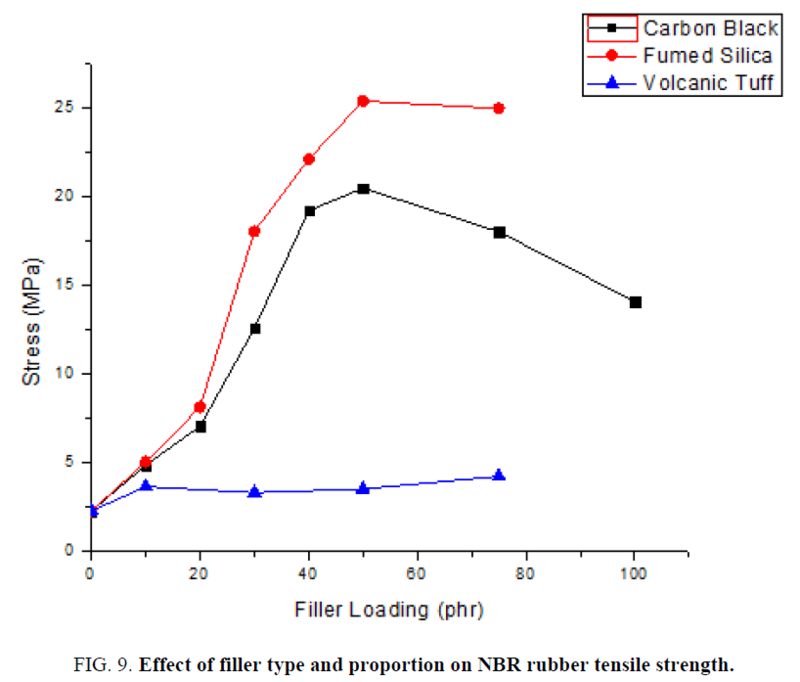 Effect of volcanic tuff on NBR rubber tensile strength: The volcanic tuff effect on NBR rubber tensile strength is very weak and could be due to its relatively large grain dimensions and small specific surface compared with carbon black and silica particles. Volcanic tuff grains may not, therefore, distribute finely between rubber chains. It is expected that ultra-fine grinding of volcanic tuff grains to under sub-micron dimensions may improve its effectiveness in strengthening the NBR Krynac 3370F rubber. The Figure. 10 shows the impact of fillers type and proportion on the elongation at break of NBR rubber. Figure 10: Effect of filler type and proportion on NBR rubber elongation at break. Up to 50 phr proportion, increasing each filler leads to a substantial increase of the elongation at break of NBR rubber batches. After that, carbon black and silica induce a clear decrease in the elongation at break . This can be attributed to an increase in volume fraction of carbon black and silica particles and the inadequate rubber fraction to bind them effectively. Figure. 10 shows also that the fumed silica effect overcomes that of carbon black in the rubber elongation at break which is higher than 800% with fumed silica and 500% with the carbon black. This behavior can be related to the difference in specific surface and active groups kind and quantity on carbon black and fumed silica and the potential impact of silica on reducing crosslinking density. This is consistent with the study carried out by Ali Asghar Davoodi and his colleagues in 2014 , where they demonstrated that NBR rubber low crosslinking density is observed with silica because its superficial functional groups absorb vulcanization agents and, thus, reduce crosslinking density in NBR rubber. Regarding NBR Krynac3370F rubber reinforced by volcanic tuff, the elongation at break remains within 200-300%. This could be related to its large micro particles dimensions and limited surface activity compared with both carbon black and silica particles. Figure. 11 and Figure. 12 shows the effect of filler type and proportion on NBR Krynac 3370F rubber Young's modulus at 100% and 300% strain. Figure 11: Effect of filler type and proportion on NBR rubber Young's modulus at 100% strain. 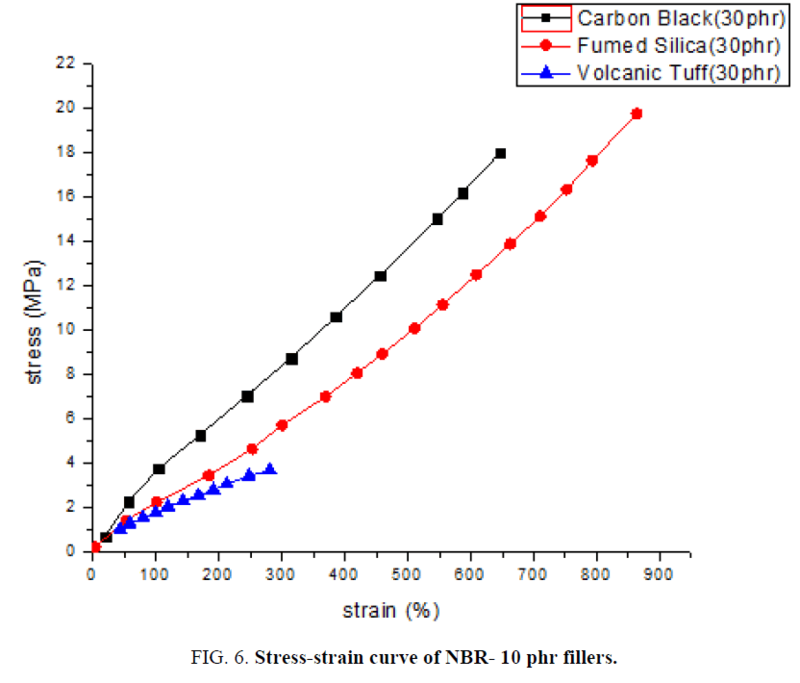 Figure 12: Effect of filler type and proportion on NBR rubber Young's modulus at 300% strain. 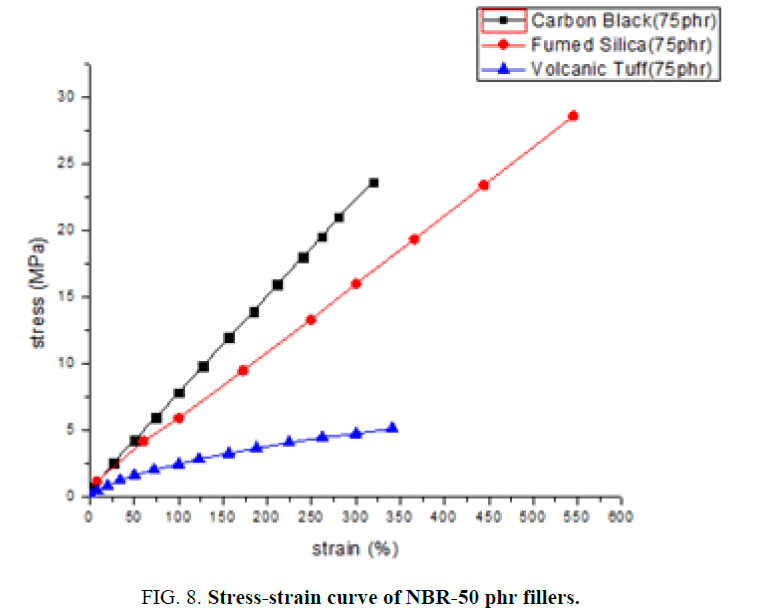 Young modulus at 100% strain increases similarly with both carbon black [13,16] and fumed silica, but for Young modulus at 300% strain, carbon black effect overcomes that of fumed silica between 20 and 80 phr filler . 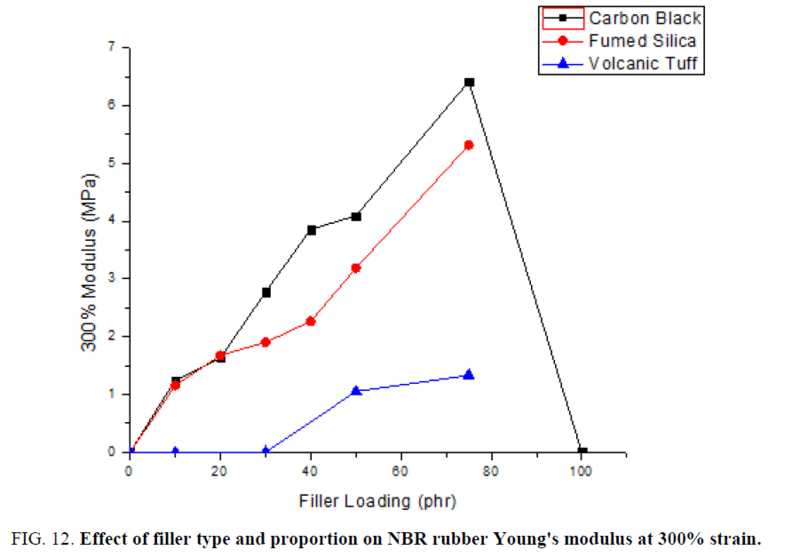 Regarding volcanic tuff, its impact on NBR rubber Young modulus is very weak at 100% strain and at 300% strain, NBR rubber did not attained 300% strain level up to 30 phr volcanic tuff, where a limited increase in Young modulus is observed between 30-80 phr volcanic tuff. Based on the above, the filler effect seems to be related to several factors, namely the filler ratio in rubber mixture, the mutual interactions between filler particles and rubber chains and filler potential impact on crosslinking density of the rubber. Figure. 13 shows the impact of filler type and proportion on the toughness of NBR Krynac 3370F rubber. Figure. 13 shows that the toughness of the NBR Krynac 3370F rubber reinforced by fumed silica is clearly superior to that with carbon black. It is, therefore, clear that increasing silica content leads to higher NBR rubber strain at break and higher toughness. 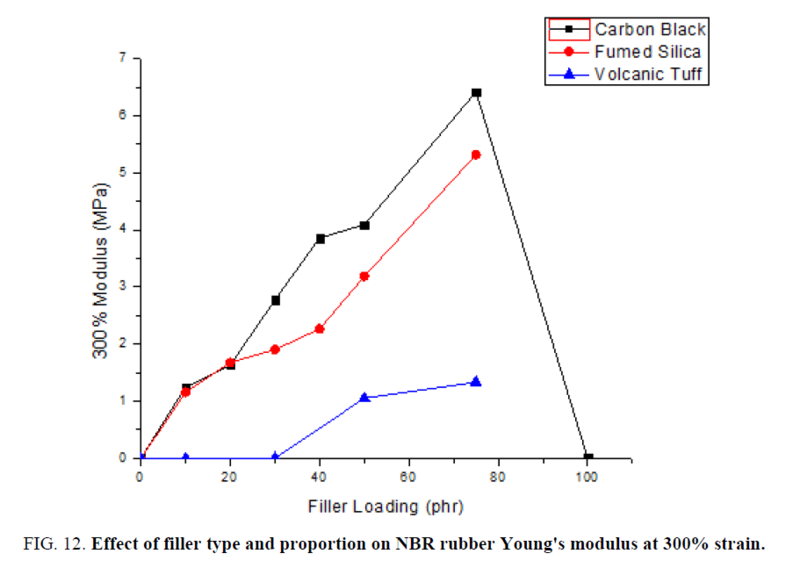 For volcanic tuff, its impact on NBR rubber toughness was very weak compared with carbon black and silica. This behavior is due to the low deformation at break of NBR rubber with volcanic tuff exhibiting large particle size of low specific surface. 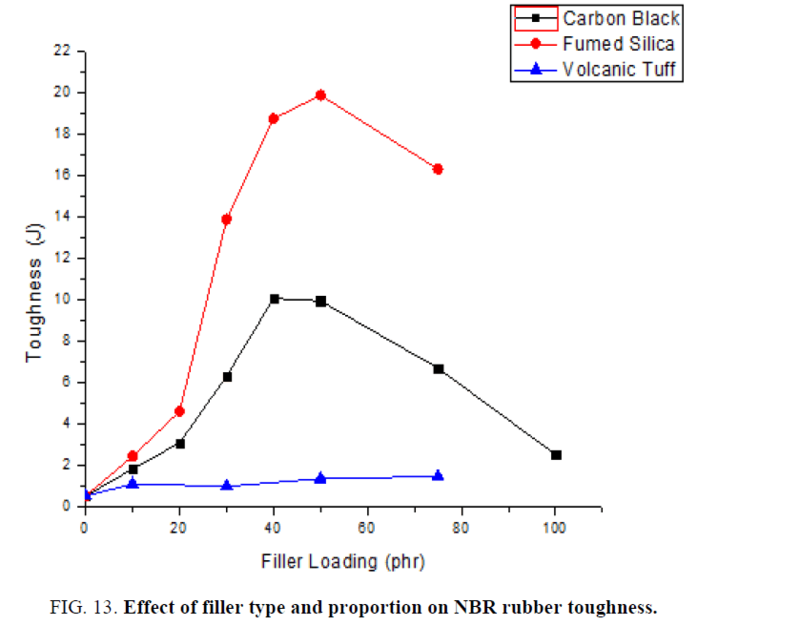 Effect of filler type and proportion on NBR rubber hardness: Figure. 14 shows the impact of carbon black, fumed silica, and volcanic tuff proportion on the hardness of the NBR rubber. 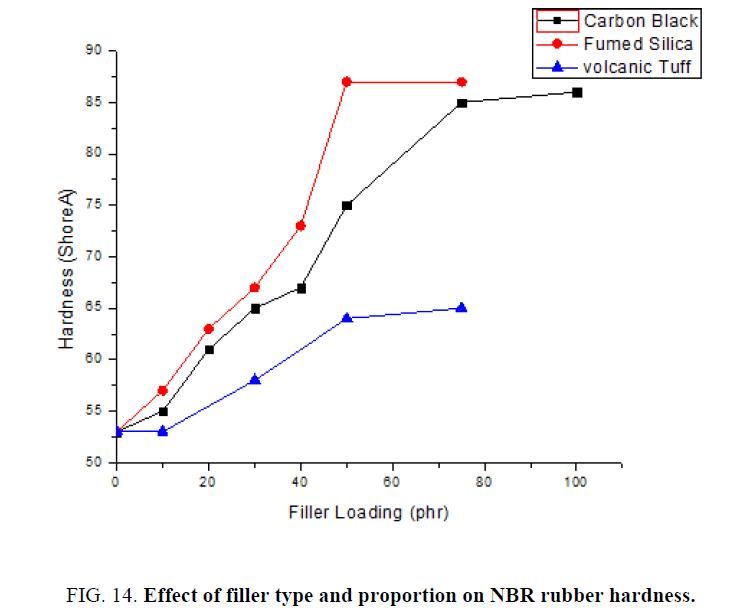 Figure 14: Effect of filler type and proportion on NBR rubber hardness. Experimental results show that increasing filler proportion in the three groups (carbon black [13,16], fumed silica  and volcanic tuff), leads to a significant increase of NBR rubber hardness which reaches the value of 86 Shore A in the first group at 100 phr ratio, the value of 87 Shore A at 75 phr ratio in the second group and the value of 65 Shore A at 75 phr ratio in the third group. The hardness increase is due to a good distribution of filler particles within the rubber structure as filler proportion is growing and to the multiple interactions between fillers surface functional groups and rubber chains. As the hardness of fumed silica particles is higher than that of carbon black, fumed silica effect on NBR rubber hardness overcomes that of carbon black . 1. 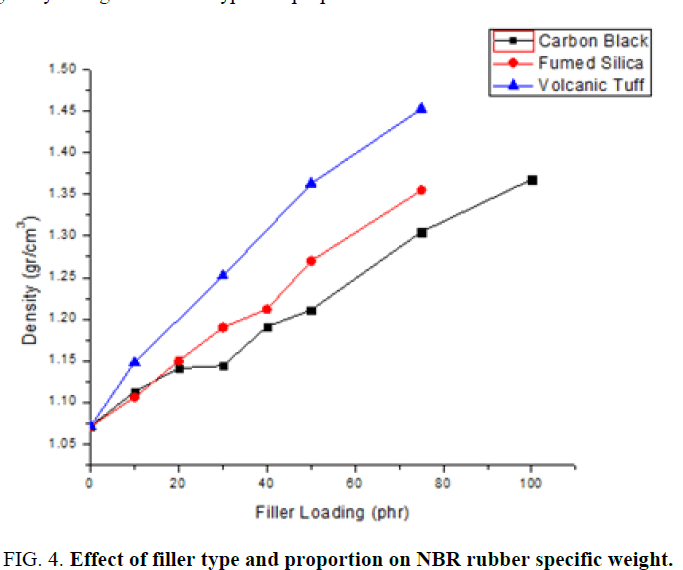 The present work confirms the possibility of changing the proportions of carbon black, fumed silica, and volcanic tuff fillers in NBR Krynac 3370F rubber within a wide range of 0-100 phr allowing changing and improving NBR mechanical properties according to the requirements of different applications. 2. This work allowed the determination of the appropriate process conditions for the preparation of NBR rubber mixtures, sheets and mechanical tests samples with carbon black, fumed silica, and volcanic tuff. 3. Experimental results showed the improvement of the mechanical properties and hardness of NBR rubber, particularly with carbon black, fumed silica. Volcanic tuff did not really increase mechanical properties, but preserved them up to 75 phr which reduce significantly NBR rubber cost. 4. The improvement in mechanical properties and hardness of NBR rubber has been realized without the use of silane coupling agent or compatibility agent between NBR rubber and reinforcing fillers. 5. Experimental results in this study have shown the clear superiority of fumed silica in improving the mechanical properties of NBR Krynac 3370F rubber mixtures in comparison with carbon black. This work was financially supported by Higher Institute for Applied Science and Technology (HIAST), department of Applied Physics, laboratory of materials science. Likozar B, Major Z. Morphology, mechanical, cross-linking, thermal, and tribological properties of nitrile and hydrogenated nitrile rubber/multi-walled carbon nanotubes composites prepared by melt compounding: The effect of acrylonitrile content and hydrogenation. Appl. Surf. Sci. 2010;257(2):565-73. Mostafa A, Abouel-Kasem A, Bayoumi MR, El-Sebaie MG. Effect of carbon black loading on the swelling and compression set behavior of SBR and NBR rubber compounds. Materials & Design. 2009;30(5):1561-8. Padhiyar S, Shah D. Effect of silanes as crosslinking agent with the NBR rubber. Int. J. Innov. Res. Sci. Eng. Technol. 2013;2(5):1577-81. Alneamah M, Almaamori M. Study of thermal stability of nitrile rubber/polyimide compounds. International Journal of Materials and Chemistry. 2015;5(1):1-3. El-Nemr KF. Effect of different curing systems on the mechanical and physico-chemical properties of acrylonitrile butadiene rubber vulcanizates. Materials & Design. 2011;32(6):3361-9. Orient Black N330 ® Furnace Carbon Black Pigment. Available from: http://www.pcblltd.com/PDF/Products/TDS_Orient-Black-N330.pdf. AEROSIL® 200 Hydrophilic fumed silica [Internet]. Essen, Germany. Available from: http://www.aerosil.com/. General Establishment of Geology and Mineral Resources. Available from: www.geology.sy.org/. LANXESS Deutschland. Business Unit Technical Rubber Products Krynac 3370F - Product Data Sheet. Available from: http://www.symtake.com/en/uploads/filelist/1000/2/1382410780_c0a80afdea1c1dd2.pdf. Coran AY. Handbook of Elastomers. BhowmickAK, Stephens, HL, editors. Florida: CRC Press; 2001. 249 p.
ASTM D412-16. Standard Test Methods for Vulcanized Rubber and Thermoplastic Elastomers-Tension [Internet].Available from: https://www.astm.org/. DIN 53505[Internet]. Available from: https://www.tqc.eu/en/products/article/shore-hardness-gauge-din-53505-iso-868-astm-d2240/standards. Al-maamori MH, Al-zubaidi AA, Subeh AA. Effect of carbon black on mechanical physical properties of acrylonitrile butadiene rubber (NBR) composite. Academic Research International.2015;6(2):28-37. Rajkumar K, Ranjan P, Thavamani P, et al. Dispersion studies of nanosilica in NBR based polymer nanocomposite. Rasayan. J. Chem. 2013;6:122-33. Davoodi AA, Khalkhali TA, Salehi MM, et al. Burst diaphragms based on carbon black/silica hybrid filler reinforced nitrile rubber compounds. Journal of Soft Matter. 2014 Sep 2;2014. Jovanovi? V, Budinski-Simendi? J, Samard?ija-Jovanovi? S, et al. The influence of carbon black on curing kinetics and thermal aging of acrylonitrile-butadiene rubber. Chemical Industry and Chemical Engineering Quarterly/CICEQ. 2009;15(4):283-9.